I had a phone call today, someone wanted to know if I spend my day on the defensive or on the proactive front in cycling. I asked the question 'do you call me about how good cycling is or how bad?'. Unfortunately, if you are into cycling advocacy you spend most of your time on the defensive. Often you feel like you are the tobacco or pokies lobby because you are always 'pedalling' something others don't want or will complain about. An example of this is the action taken today by the Alliance against a Holden Dealership in Brisbane. This Holden dealership decided to jump on the bandwagon coursing through the veins of a Gold Coast anti-cycling paper where a journalist a few years back 'declared war on cyclists'. 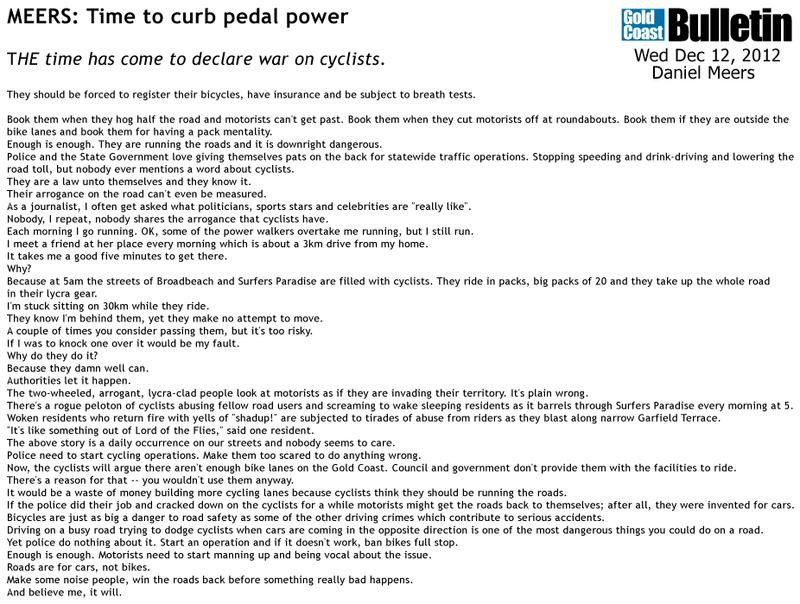 The Gold Coast Bulletin are well known for hating bicyclists, ever since Daniel Meers (media manager of our current prime minister) said he 'declares a war on cyclists' in 2012 we have seen this newspaper wave the red flag and the mindless bigots ever since. Just remember that name, he is everything bad in media and now councils our Prime Minister. Drivers for registration of Cyclists was one of the good guys, he wrote some of the best 'fan-fiction' on his page. It was worth just waiting for the next piece to be written. Something happened recently and we are told he has gone to the dark side - insisting the riders of Australia should only be in single-file unless they are elite riders. Luckily he doesn't speak for anyone important but as a competitive cyclist himself - he makes the white noise a little greyer. This stuff was good, very funny. 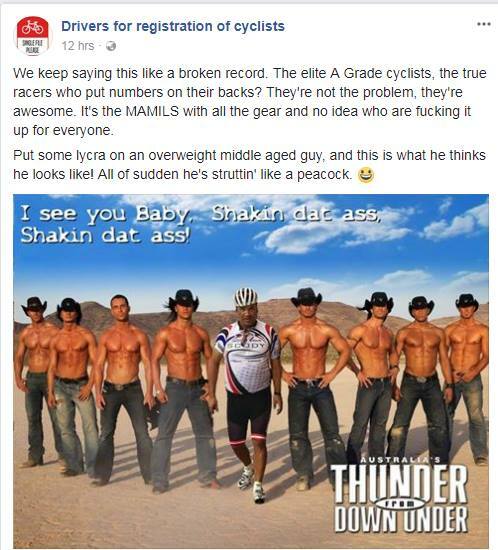 But Brisbane is unique in one thing, we know most of the hate pages come out of Brisbane, recently 'Brisbane's Worst Cyclists' was closed down, but there are still at least 6 others that we know of with Brisbane or Queensland in the name. Then you have people in Brisbane running National pages, yip - indeed, you people in Brisbane liking the comments on that Sydney page - you are agreeing with a Maroon. Where is your state pride?? 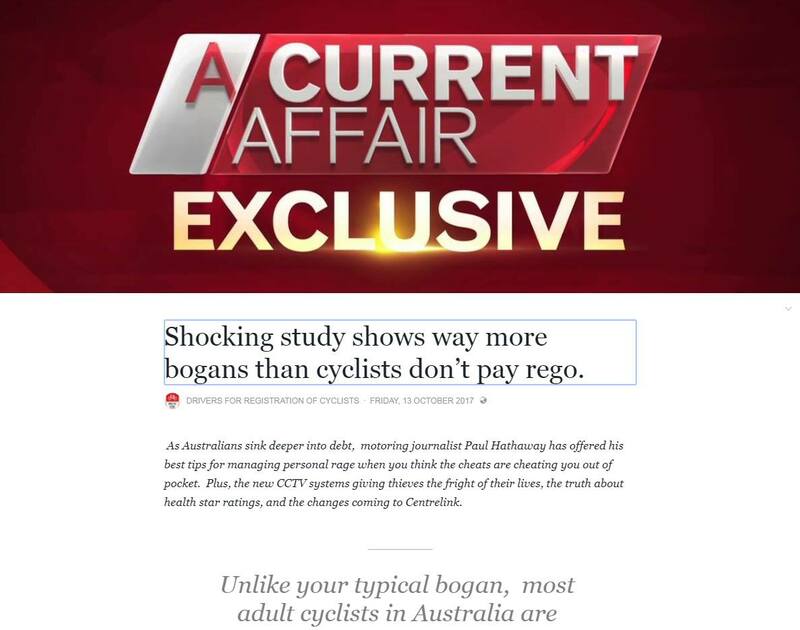 But as we commented a while back, it takes a lot to hate and a quick search right now see many of these pages gone or down to only a few likes - leaving Brisbane the hot bed of Bicycle Hatred. Well, of course there was going to be threats against our lives, and of course we were going to see the worst of people as predictable as the tides and the moon. What were they thinking? Well, it appeared that it was just a part of their social media campaign. A few people (like myself) took objection to this and asked them to remove their post, suggesting a post goes up that better explains their position. After all, a top Australian racing team bears the name Holden Womens Racing. So after advising them to remove the post and being told no, we escalated. We called for people that objected to this to tell them why, and before long a number of riders joined in on our objection. The number of riders was around 50 at last look and the dealership (with pressure from another Cycle follower) decided to remove their post. It took a lot of time but they did it. We advised our member forum of this and then sent a message to them to say this is only half way, we need them to post an apology. We also need them to acknowledge that bicyclists pay their share because roads aren't paid for by a non-existent road tax. They are paid for through general taxes and council rates. So the final result came through a few hours later... and apology of sorts. So what do you think of the final comment? Do you think we went too far, do you think they went far enough? Join in on the conversation on Facebook and Twitter. Our hashtag for this is #HoldenGateGC as they were caught red handed with a paper trail we won't soon forget.